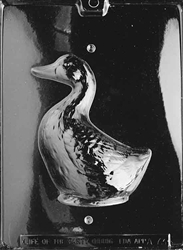 At six inches tall the large goose makes a terrific centerpiece or perhaps a companion for nursery rhyme time. Requires A073A to complete the 3D version. 3D Goose Mold - Front pairs with Back Mold LPA073A to complete the 6" tall whole bird. Each piece is 4-1/2" x 6"